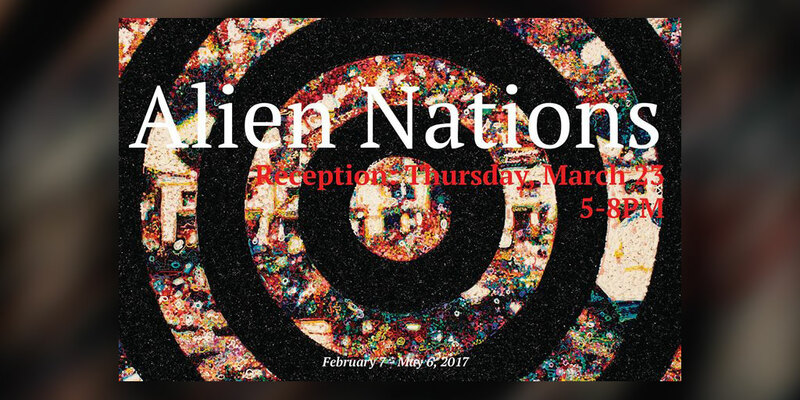 The Lehman College Art Gallery’s new show Alien Nations, will have its opening night reception on Thursday, March 23, from 5 to 8 p.m.
Alien Nations explores how artists convey a sense of people’s alienation from modern society. During a time of great political upheaval around the globe, the exhibition, which will last until May 6, looks at how a myriad of social issues affect the psychological state of the individual. The exhibition addresses the gnawing modern malaise of humankind, a growing collective sense that we are increasingly “plugged in” to a technology-drenched society, in which—despite instantaneous communication and thousands of online “friends”—the world becomes ever more alienating to our fragile individual identities and our uncertain places in the world. The exhibition presents a broad range of media by both emerging and established artists who express their visions through painting, photography, sculpture, installation, video, and performance documentation. Alien Nations brings together 18 artists whose works reflect on issues of the individual’s identity within today’s social disorder, including: Lisa Alonzo; Hernan Bas; Suzette Bross; Patricia Cazorla; Jesse Chun; Richard Deon; Lalla Essaydi; Carla Gannis; Scherezade Garcia, Katy Grannan; Mona Hatoum; Meg Hitchcock; Alison Kuo; Cecilia Mandrile; Lothar Osterburg; Nancy Saleme; Nari Ward; and Tricia Wright. All of the works in the exhibition speak of contemporary forms of alienation—be they personal or collective, self-inflicted or enforced by others, or drawn from real, historical models, or from fictional, imagined creations. The exhibition includes works by artists such as Nari Ward who reflects on social protest using colorful, hand-dyed shoelaces as a comment on the importance of the role of social protest in the national conversation today. Artist Lalla Essaydi, who was raised between Morocco and Saudi Arabia and who currently lives in the United States, portrays the life of women in Islamic society today in her series “Bullet Revisited.” Photographer Katy Grannan depicts unnamed women, alone against blank white backgrounds in the blinding Southern California sun, presenting themselves as glamorous, but undercut with a strong sense of life’s despair. Several of the artists in the exhibition look at how language itself can create a sense of disjointed isolation and alienation. Meg Hitchcock’s work creates Jewish prayer cloths cut from thousands of letters in the Bible and the Koran—religious-based text works that literally dissect the word of God, discouraging her audience from reading by ignoring punctuation and spacing in the sentences she forms. This sense of being lost in translation, of meaning rendered meaningless, is echoed in the work of Lothar Osterburg’s City of Towers series, showing a rising landscape (clearly inspired by Pieter Bruegel the Elder’s Tower of Babel) in which the prideful builders of a tower designed to reach the heavens are punished by suddenly speaking a myriad of languages which render them incomprehensible to one another. The exhibition is made possible by a grant from the New York State Council on the Arts with the support of Governor Andrew Cuomo and the New York State Legislature New York City Department of Cultural Affairs, the Jarvis, Constance Doctorow Family Foundation and the New Yankee Stadium Community Benefits Fund. Alien Nations will run from Feb. 7 until May 6. The opening reception will be held on March 23 from 5 to 8 p.m. The reception is free and open to the public. For more information please go to www.lehmangallery.org.